In the stats section, you find information about the creative writing process and the problem domain. Stats for Geeks is a fun section to illustrate that writing can be challenging but also fun if you are into technology and geek culture. OCP is also an abbreviation for Omni Consumer Products, the megacorporation from the movie RoboCop. OCP is an anagram for POC (proof of concept). On the International Women’s Day , I start writing this article. In our company nothing special. We don’t distinguish between female and male engineers. In a customer project, I am supporting the infrastructure team. A dedicated production server farm uses VMware to provides services for its customers. The OpenShift Container Platform runs on virtual machines to deploy Docker containers with Kubernetes. The production platform is highly available. The platform has three master nodes and multiple application nodes. For our non-technical users a glossary for the beauty of distributed systems in a world full of containerised software. container = A Docker container image is a lightweight, standalone, executable package of software that includes everything needed to run an application: code, runtime, system tools, system libraries and settings. etcd = etcd is a distributed key-value store that provides a reliable way to store data across a cluster of machines. pod = A pod (as in a pod of whales or pea pod) is a group of one or more containers (such as Docker containers), with shared storage/network, and a specification for how to run the containers. Red Hat OpenShift Container Platform (OCP) = a production platform for launching Docker containers. VMware vSphere (vsphere) = a cloud computing virtualization platform. Find below a brief overview of the storage architecture in the OpenShift Container Platform. Containers are stateless and ephemeral, but applications are stateful and need persistent storage. Data infrastructure software like PostgreSQL, Elasticsearch or Apache Kafka must store their data on persistent storage volumes; otherwise, we lose stored data after every restart, relocation or redistribution. Kubernetes manages storage in OpenShift. You can either invoke the OpenShift command line (oc) our use the Kubernetes command line (kubectl) to manage the underlying storage infrastructure. High availability of storage in the infrastructure is the responsibility of the underlying storage provider. The VMware vSphere platform provides several solutions for that. 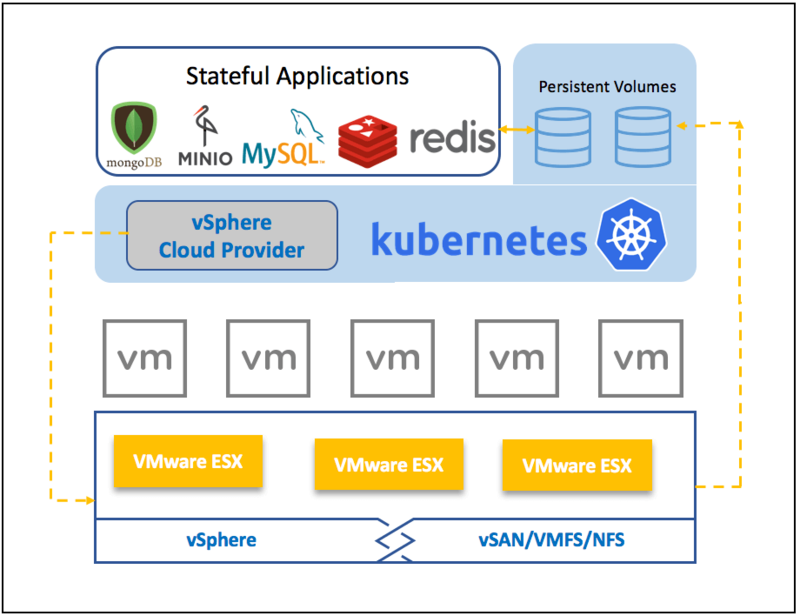 VMware adds this persistent storage support to Kubernetes through a plugin called vSphere Cloud Provider. Kubernetes provides many possibilities. See below an overview for VMware vSphere. A Kubernetes volume is different than a Docker volume! In Docker, a volume is merely a directory on disk or in another Container. The Kubernetes volume is an additional abstraction that outlives the containers in a running pod. Kubernetes has a vast selection of volume types. A StorageClass provides a way for administrators to describe the «classes» of storage they offer. Different classes might map to quality-of-service levels, or backup policies, or arbitrary policies determined by the cluster administrators. Kubernetes itself is unopinionated about what classes represent. This concept is sometimes called «profiles» in other storage systems. zeroedthick (default) – Space required for the virtual disk is allocated during creation. eagerzeroedthick – Space required for the virtual disk is allocated at creation time. In contrast to zeroedthick format, the data remaining on the physical device is zeroed out during creation. It takes the longest time of all disk types. thick – Space required for the virtual disk is allocated during creation. thin – Space required for the virtual disk is not allocated during creation, but is supplied, zeroed out, on demand at a later time. We use govc to manage our virtual machines. To setup govc, I use these setup instructions. For convenience in the later operations, we set up some default values. You can override them by passing the values in the command line interface. Enabling VMware vSphere requires installing the VMware Tools on each Node VM. We check the installation. [root@master1 ~]# yum search "VMware"
The is a minor difference between the commercial VMware Tools and Open VM Tools extension. For server usage, the open-vm-tools are sufficient. Set the disk.EnableUUID parameter to true for each Node VM. This setting ensures that the VMware vSphere’s Virtual Machine Disk (VMDK) always presents a consistent UUID to the VM, allowing the disk to be mounted properly. govc vm.change -e="disk.enableUUID=true" -vm="/dc3/vm/OpenShift/Master Nodes/master1"
govc vm.change -e="disk.enableUUID=true" -vm="/dc3/vm/OpenShift/Master Nodes/master2"
govc vm.change -e="disk.enableUUID=true" -vm="/dc3/vm/OpenShift/Master Nodes/master3"
govc vm.change -e="disk.enableUUID=true" -vm="/dc3/vm/OpenShift/Application Nodes/worker1"
govc vm.change -e="disk.enableUUID=true" -vm="/dc3/vm/OpenShift/Application Nodes/worker2"
govc vm.change -e="disk.enableUUID=true" -vm="/dc3/vm/OpenShift/Application Nodes/worker3"
govc vm.change -e="disk.enableUUID=true" -vm="/dc3/vm/OpenShift/Application Nodes/worker4"
govc vm.change -e="disk.enableUUID=true" -vm="/dc3/vm/OpenShift/Application Nodes/worker5"
To reboot the cluster do for each node a reboot. This example reboots master node 3. Check if the UUID is ok. There is a known UUID bug. [root@master1 /]# kubectl describe node master1 | grep "System UUID"
Verify that you have all identical files on all nodes! This approach worked with minor adjustments to the given OpenShift examples. This process involves the cluster administrator and OpenShift developer. The vSphere Cloud Provider plugin for Kubernetes can perform step 1 and 2 and thus dynamically provision storage only with PVCs. To accomplish that we have to define a StorageClass definition. The administrator is not involved in this procedure. This approach has given me headaches since there were multiple pitfalls and obstacles to overcome. These steps are the standard procedure. Create a persistent volume PV for that disk. Create a persistent volume claim PVC for the PV. As to layout, we need to create a virtual disk on the vSphere storage. Create a virtual disk with 10 GB disk space. Ensure that the volumes dir exists on the storage. As the vmdk name, I choose jesus.vmdk because of it always funny when the cluster admin tells me that he had found Jesus. The disk name must comply to following regex. Check the new virtual disk. We map the new vmdk to a new persistent volume. Pay attention that the storageClassName is mandatory for us to make it work. We use the OpenShift CLI to create the persistent volume. OpenShift invokes Kubernetes internally. The claim name is vinh, and we map the claim to the persistence volume pv0001. Pay attention that we claim only 1 GB of 10 GB. That makes no sense, but it works. Requesting more storage than the persistent volume has, results to failure. We created a pv and claimed it with the pvc. The OpenShift Container Platform persistent volume framework enables dynamic provisioning and allows administrators to provision a cluster with persistent storage. The framework also gives users a way to request those resources without having any knowledge of the underlying infrastructure. To perform dynamic provisioning, we need a definition for a default storage. Therefore we use the annotation storageclass.kubernetes.io/is-default-class: "true". Check for a similar StorageClass definition. For our troubleshooting we use jq - a JSON processor. We use it to extract only relevant information. This oc command is identical with the kubectl command. Checking with kubectl all exisiting nodes in the OpenShift cluster and their respective roles. We check for the provider id that should contain the UUID equivalent to the system UUID. As the output is null for the provider id, we are going to patch it manually. Check the current node and memorise the system UUID. Patch the node with the memorized UUID. Repeat that for every node. After the patch, the dynamic provisioning still didn’t work. Search in /var/log/containers/*.log for datacenter.go, vsphere.go and pv_controller.go. You only see those messages by increasing the log verbosity of the OpenShift platform. See below a prettified message stack of stderr. We could rule out the UUID bug. Check the cloud provider configuration. The problem is that there no recursive mechanism. Our vm nodes are in the sub-directories Master Nodes and Application Nodes. The directory name contains a space, which also seems problematic if you don’t use proper escapes. I just followed my hunch and let the VMware administrators move the vm nodes to the right directory. Therefore we had to shut down the whole OpenShift Container Platform first. After the reboot, the dynamic provisioning works. The persistence volume claim exists and works. The virtual disk kubernetes-dynamic-pvc-548e75c0-4426-11e9-ac8a-005056ab11cb.vmdk was automatically created. Dynamic Provisioning has some advantages over static provisioning. For one as mentioned, you don’t have to bother about the underlying infrastructure. Depending on your point of view, another advantage is the automatic creation and deletion of the virtual disk and persistence volume through the persistence volume claim. Better ensure that you don’t need the data if you are going to delete a persistence volume claim. The OpenShift Container Platform by Red Hat utilises Kubernetes and Docker. Running OCP on VMware vSphere is ok. Static Provisioning of persistent storage works. Dynamic Provisioning of storage is a little bit more challenging since you have to examine the interaction between Kubernetes and the vSphere Cloud Provider. Overall it feels like an Odyssey; you have to gather information on three major products and have to discover the logging data. In the end, I have learned a lot. Troubleshooting and analysing logs are essential. Without Elasticsearch it is a cumbersome task.